When Hurricane Sandy ripped through Staten Island, it left a trail of death and devastation that continues to haunt many people. To prevent similar destruction in the future, SCAPE/Landscape Architecture designed the The Living Breakwaters project, which aims to revive ecologies and reduce risks of flooding in the future. 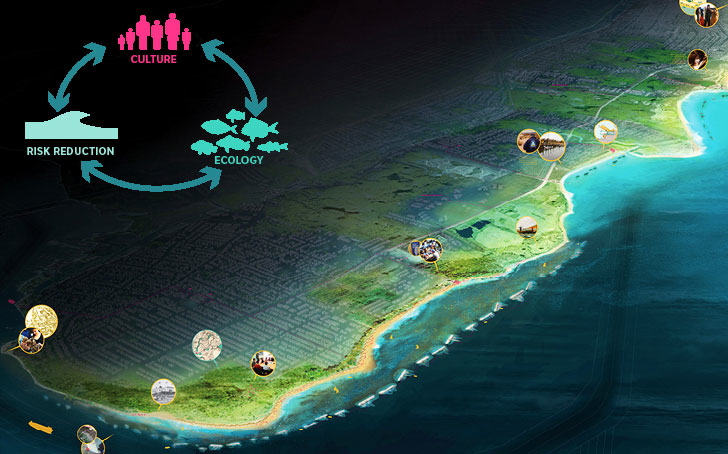 Designed specifically for Staten Island and Rarutan Bay, the project is comprised of a necklace of breakwaters that would provide a buffer against wave damage, flooding and erosion. It was chosen as one of the winning proposals at this year’s Rebuild By Design competition and the team has been awarded a whopping $60 million to implement the design. The proposed necklace of breakwaters includes a “reef street,” and micro-pockets that would be used as habitats for finfish, shellfish and lobsters. This infrastructure consisting of programmed water hubs would be complemented by the Billion Oyster Project and empower local schools with science, education and access. The necklace would be located along the South Shore and would act as a buffer against wave damage, flooding and erosion. A myriad of water-based activities would take place behind the Living Breakwaters, including programs suggested by the local community. Although the project was designed with Staten Island in mind, its south shore in particular, it could also be applicable in other waterfront communities faced with similar security issues. This infrastructure consisting of programmed water hubs would be complemented by the Billion Oyster Project and empower local schools with science, education and access. The proposed necklace of breakwaters includes a “reef street,” micro-pockets which would be used as habitats for finfish, shellfish and lobsters. The necklace would be located along the South Shore. it would act as a buffer against wave damage, flooding and erosion. A myriad of water-based activities would take place behind the Living Breakwaters, including programs suggested by the local community. Although the project was designed with Staten Island in mind, its south shore in particular, it could also be applicable in other waterfront communities faced with similar security issues.